I am a member of both the Law Society of Ontario and Barreau du Quebec. Am I able to claim exemption in Ontario based upon the mobility exemption (g)? Due to the differences in the legal systems between Quebec and the common law mobility jurisdictions, Quebec is not a RECIPROCATING JURISDICTION under the National Mobility Agreement for the purposes of mobility exemption (g). If, however, a LAWYER is called as a lawyer in Quebec or acting as a Special Canadian Legal Advisor member of the Chambre des Notaires du Québec, and is called in more than one RECIPROCATING JURISDICTION, then the LAWYER may be eligible for exemption (g) provided the LAWYER is resident (or “deemed resident” as defined in the Exemption Eligibility Rules) in a RECIPROCATING JURISDICTION and demonstrates proof of coverage for the practice of law in Ontario under the mandatory professional liability insurance program for the RECIPROCATING JURISDICTION. I am an Ontario LAWYER and am representing a client in a proceeding in British Columbia that will take several months to resolve. Can I practise in B.C.? Do I have to notify anyone of my intention to do so? Will I have law society program insurance coverage, and if so, which jurisdiction’s coverage is in effect? The National Mobility Agreement enables lawyers to practise in another signatory jurisdiction on a temporary basis (i.e. up to 100 days in a calendar year without permit), provided that they meet all requirements of the Agreement pertaining to their status with the Law Society of their home jurisdiction (i.e. they are entitled to practise law without restriction in a signatory common law jurisdiction, have liability insurance and defalcation coverage, are not subject to criminal or disciplinary proceedings and have no discipline record). Provided that the B.C. proceeding requires no more than 100 days of your participation, you will be able to continue to act as legal counsel to your client on this matter in B.C. You do not have to notify anyone of your intention to do so, and you will have insurance coverage for the services you provide in B.C. Since your home jurisdiction is Ontario, your mobility services in B.C. would be insured under the LSO program POLICY. If a CLAIM arises out of these services you provided in B.C., you would report the CLAIM to LAWPRO. 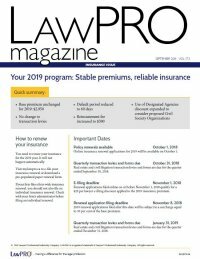 If I move my law practice to Nova Scotia permanently, but wish to remain a member of the Ontario bar, do I have to maintain my law society program insurance in both jurisdictions and whom do I need to notify? If a CLAIM arises out of PROFESSIONAL SERVICES I provided in the past in Ontario, which law society program covers me? You must maintain the practice coverage under the law society program in the mobility jurisdiction in which you are practising and resident. The Law Society of Ontario has expanded its exemption criteria to allow an Ontario LAWYER who plans to take up residency in, for example, Nova Scotia and practise there, to apply for exemption under the Ontario program. The principal criterion here is where you are resident, the assumption being that you will practise and maintain insurance coverage in the jurisdiction where you are resident. You maintain the mandatory professional liability insurance coverage in Nova Scotia. If a CLAIM arises out of your Nova Scotia practice, it is your Nova Scotia policy that will respond. The Ontario program will provide you with protection for CLAIMS that subsequently arise out of your earlier practice in Ontario. You would have coverage of $1 million per CLAIM / $2 million in the aggregate if practising, and $250,000 per CLAIM and in the aggregate Run-Off Coverage if not in practice. A Calgary-based law firm has a long-standing client with some interests in Ontario. Can the firm’s Calgary lawyers now provide services to that client in Ontario? If a CLAIM arises out of services provided by that Calgary lawyer in Ontario, which law society program policy would respond? Is that lawyer provided the same level of coverage (i.e. $1 million per CLAIM/$2 million in the aggregate), as we are in Ontario? Provided that the Calgary lawyer meets all of the requirements of the National Mobility Agreement, the lawyer can, on a temporary basis, practise in Ontario and provide services to their client and others. One condition is that the total number of days in which the Calgary lawyer practises in Ontario on a temporary basis cannot be more than 100 days in a calendar year (without any individual extension on the part of the host law society). If there is a CLAIM, the responding law society program policy is the lawyer’s home jurisdiction, in this case the Law Society of Alberta program policy. The lawyer would have coverage that is at least the same in scope as that offered in Ontario, with respect to the CLAIM. If the Alberta program under which the lawyer is insured offers a greater scope of coverage, that coverage would apply, subject to the limits of $1 million per CLAIM / $2 million in the aggregate.